In their attempt to stay alive in the Western Conference playoff race, the Chicago Blackhawks secured two crucial points their last time out. The next two might not come as easily. The Blackhawks look to sustain their postseason hopes and salvage a split of the season series with the Columbus Blue Jackets on Sunday night as the teams meet for the second time in five days. Chicago (37-33-8), which last reached the playoffs in 2001-02, saw its current postseason aspirations take a hit after its four-game losing streak from March 7-12. The Blackhawks, however, have since gone 4-2-1, including a 4-3 win at St. Louis on Saturday night to move within four points of Nashville, Vancouver and Edmonton for the eighth and final playoff spot in the West. Chicago has four games remaining, as do the Predators and Canucks. Edmonton has two games left. Duncan Keith and Craig Adams each contributed a short-handed goal and an assist Saturday for Chicago, which prevailed despite allowing three third-period goals. "It was a big win," Blackhawks coach Denis Savard said. "It keeps us in (the playoff chase). We came here to do a job, get two points and we got it." The Blackhawks received another strong effort from Nikolai Khabibulin, who turned aside 31 shots to improve to 6-1-2 with two shutouts and a 1.69 goals-against average in his last 10 appearances. He was able to bounce back after Wednesday's 4-0 loss at Columbus (34-33-11). Two of the Blackhawks' five shutout defeats this season have come against the Blue Jackets. 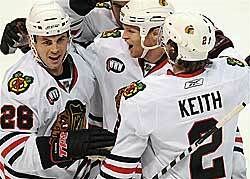 Chicago fell to 3-4-0 against Columbus in 2007-08, after splitting the eight-game series last season. Khabibulin is 1-3-0 with a 3.28 GAA versus the Blue Jackets this season, but he is 3-0-0 with two shutouts and an 0.91 GAA in his last four home appearances. The Blackhawks play their next three games at the United Center before finishing the regular season at Detroit next Sunday. Columbus plays three of its remaining four games on the road, where it has dropped four straight. The Blue Jackets have been shut out twice in their last three games, including a 2-0 home defeat against Nashville on Friday. They couldn't score despite totaling a season-high 43 shots - three nights after they had 36 shots on net in a 3-0 loss to the Predators on the road. "If you look back on it, we're not able to finish (against Nashville)," Blue Jackets coach Ken Hitchcock said. "We just don't win the one-on-one battles in the offensive zone." The Blue Jackets will look to Rick Nash, who leads the team with 38 goals and 67 points, to get their offense back on track. Nash has been kept off the scoresheet in two of his last three games, but has four goals and four assists in seven games versus Chicago this season. In 31 career meetings with the Blackhawks, Nash has 17 goals and 35 points - his most against any opponent. Columbus, which is one win shy of the franchise record it set in 2005-06, failed to reach the playoffs in any of its previous seven seasons. While it hasn't been mathematically eliminated from contention yet in 2007-08, it is seven points behind the three teams tied for the final Western Conference spot.